If you’re searching for a long-lasting solution to beautiful, thicker eyelashes, look no further than Latisse. Now available at Siti Med Spa in San Diego. We all want full, gorgeous eyelashes. While they may seem like a small detail on a woman’s face, thicker eyelashes can dramatically enhance the eyes and make them look wider, brighter, and more feminine. If you weren’t gifted with naturally long eyelashes, or if you have lost eyelashes with age, a squeeze of an eyelash curler and a swipe of mascara is a quick way make your eyes pop. However, makeup only accentuates what you already have. Plus, mascara can be nearly impossible to remove, causing your luscious lashes to dry up and break off. If you’re searching for a long-lasting solution to beautiful, thicker eyelashes, look no further than Latisse. Latisse is an FDA-approved eyelash growth serum for longer, darker, thicker eyelashes. The treatment is designed for people who have hypotrichosis, which is a condition defined by inadequate or not enough eyelashes. By applying Latisse to the base of the your upper eyelashes as part of your nightly beauty routine, you’ll notice longer lashes in as few as four to six weeks and thicker eyelashes at 16 weeks. 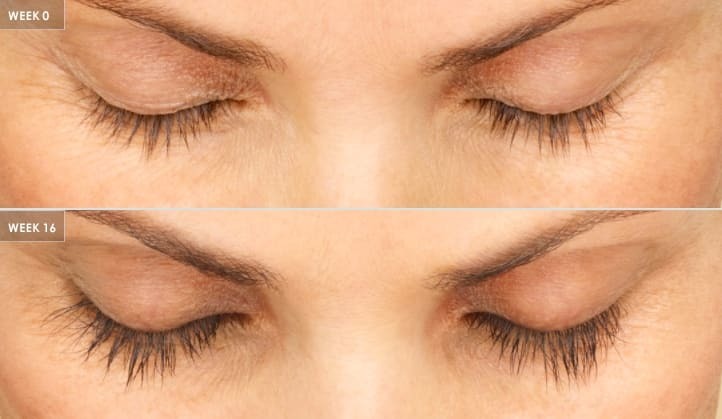 Unlike mascara and eyelash extensions, Latisse isn’t an illusion of length or fullness. It promotes real eyelash growth for dramatic, natural results. Latisse is the only eyelash growth treatment of its kind available by prescription. Latisse makes lash growth possible because of its active ingredient: bimatoprost. Latisse is believed to prolong the growth phase (anagen) of the eyelash hair cycle. This causes existing lashes that would have otherwise stopped growing and fallen out to continue getting longer. Latisse also increases the number of hairs produced during the growth phase, resulting in a fuller, thicker appearance. Once you begin using Latisse, you must continue to apply the solution to the base of your upper eyelashes every night. If you stop using Latisse or are inconsistent with your application, your eyelashes will return to their previous appearance over the course of a few weeks or months. Latisse is a prescription treatment you take home and apply yourself, so it’s important to follow your doctor’s instructions carefully. Start by removing your makeup and washing your face, including the upper eyelids. Remove your contact lenses if you wear them (you can put them back in 15 minutes after applying Latisse). Grow old gracefully? Meh. Who needs yet another reason to hate the aging process? So why do eyelashes thin and shorten, and is there any cure for it? Siti Med Spa in San Diego explores what might be causing your eyelashes to fall out and how you can fight back. Add a drop of Latisse to one of the single-use applicators supplied in the package, and carefully apply it to the skin at the base of your upper eyelashes. The area should be moist, but not wet; blot excess Latisse solution with a clean tissue. Discard the applicator and repeat the process with a new applicator on the other eyelid to avoid cross contamination. Do not apply Latisse to your lower eyelashes. How is Latisse different from non-prescription eyelash growth serum? Latisse is the only eyelash growth serum that has been evaluated and approved by the FDA to grow lashes thicker and longer. It has been thoroughly studied for safety and efficacy, so you can enhance your eyelashes with peace of mind. Are there any side effects associated with Latisse? The most common side effects of Latisse include slight itching and redness in the eyes, which was reported by approximately 4% of patients in the clinical trial. These minor side effects subside with continued use as the body adjusts to the solution. Contact Siti Med Spa at (619) 717-8484 to learn more about how to get thicker eyelashes with Latisse or to schedule your consultation. If you want to grow real, thick, natural, dark lashes, there’s no better choice than Latisse – and you can get it from the trusted medical staff at Siti Med Spa. We can provide you with a prescription for Latisse to give you lush lashes and to restore the youthful vibrancy of your beautiful eyes. Everyone wants thicker lashes. However, not everyone is blessed with the luscious lashes of a Hollywood starlet. There are a variety of different techniques to thicken eyelashes and Siti Med Spa in San Diego can help you get the eyelashes of your dreams. We proudly participate in the Brilliant Distinctions program. Enjoy exclusive savings on select Allergan treatments and products. Earn. Save. Repeat! Follow the link below to sign up, or contact Siti Med Spa for more information.